Move yeelight from light platform to component. As more yeelights are being released, with more features. It will make possible to support them. For example adding sensors for ceiling light, to get current power mode ( daylight / nightlight ). Or switches to support turning on off moonlight ( without having to use service call ). Also switch to turn off both main light and ambilight ( ceiling 650 ). Probably something more, as we will see what ideas we can make for better UX and support. Just move everything to yeelight namespace, and remove 2 spaces vertical. Moved yeelight into component to allow adding switches / sensors etc. Now only option to change yeelight power mode ( daylight / nightlight in yeelight ceiling lamps ), is to call service. Then its not possible to see current power mode. Added nightlight switch to turn on / off nightlight mode and get feedback about currently enabled power mode. I'm not sure about many things, regarding component -> platform communication and setup. I've looked at other components and tried to come up with something works. Whole config is identical as it was for light platform. Looking to early feedback if its done right, then I will add docs update if its ok. If this will introduce a breaking change, I would also say that we should drop the LEGACY_DEVICE_TYPE_MAP in favor of using the device provided types. edit: another note, components need to have unit tests available, so that needs to be taken care of. Thanks for initial feedback. I will work on tests and fix lint issues. You mean id presented in discover_bulbs example ? Not sure where it should be used, I assume to somehow register devices with it ? I was also wondering, how to approach light / switch synchonization of update. For example, when light is off, switching switch will turn it on, but then light waits up to 30s to update status. Is there any guideline how to synchonize between different platforms ? I was thinking light object could be passed to switch, but it looks like a bad coupling. Yeah, I'm talking about using that id as unique_id inside homeassistant's entity registry (https://developers.home-assistant.io/docs/en/entity_registry_index.html). This will allow homeassistant to identify the bulb uniquely even if its IP address changes and will enable the "rename device" option in the UI (so no need to manually use friendly_name mappings). As this information is not available with mDNS discovery (what is currently used), it has not been possible earlier. Wrt syncing, I think you can use the schedule_update (https://developers.home-assistant.io/docs/en/entity_index.html#subscribing-to-updates) even when polling is used, but I hope someone will confirm that or propose another approache. Wrt coupling, I think it's fine to pass a reference of the light to the switch as they are coupled anyway. I think I've figures out how to synchronize state between entities. Code taken from KNX integration. I've also asked on discord about help with writing tests. Response I've got was that requirements for test is not written in checklist, so maybe they are not needed ( https://developers.home-assistant.io/docs/en/creating_component_code_review.html ). I've tried looking at some similar platform, to get idea how to approach / what to tests, but still not sure how to write them correctly. As for unique id, not sure how to approach that ? Should discovery_bulb be done in component setup ? Or register some background job, and when response come, update all bulb devices to put received id ? Also is it needed to be done here. Maybe putting too large PR will make it harder to merge and somehow blocks other PR regarding yeelight. There is ongoing effort to add ambilight support for ceiling 650. Also I was thinking about adding some more config options, in separated PRs. Or its better to make one big ? I cannot say about the test requirements, but I had to create some when porting the tplink into a component.. I have not yet found time to test these changes and cannot currently promise when I'm able to do that, so I hope someone else chimes in. Anyway, on the unique_ids and other improvements, I think it's better to done it in phases to keep it simple so please ignore that for now. That conversion will be a bit more involved, basically requiring creating a config entry flow (https://developers.home-assistant.io/docs/en/config_entries_index.html) to do the discovery and initializing the platforms based on the discovery results. Moved services into component domain. I think this is ready. @rytilahti Its ready, rebased on newest code. Can you take a look at it ? I've removed switch as I'm not sure about its UX ( What it should do on off etc). Will add sensor to get current working mode for daylight / nightlight for ceiling lights. LGTM! Works fine with my Yeelight Color 1gen. Could you fix the conflict? Thanks! @syssi Thanks, rebased on new code. Are you planning on adding ceiling4 ambilight support ? I saw some post about it on community forum. I was planning to work on it, don't want to duplicate work. After merging this I wanted to make PR with python-yeelight bump and some cleaning, that will be possible with new lib version. And then I can work on ambilight support. Also I want to add power mode sensor, for better UX with moonlight mode for ceilings. @zewelor I would be happy if you do most of the job. I don't own the device. I'd like to provide some support. Please open a new PR where we can address the comments. Support for Xiaomi Yeelight Wifi color bulb. We don't add the url in the docstring anymore. We can't call an async function from sync context or vice versa. Use track_time_interval instead. Why name this async_update when it's not a coroutine or callback decorated function? We're not allowed to store the entity itself in a shared container. The entity is a platform concern. It's ok to store a reference to the entity, eg the entity_id. We don't need to access the entity here. It's enough to check for the correct entity_ids. See comment below about storing entities vs entity_ids. and no lights at all. 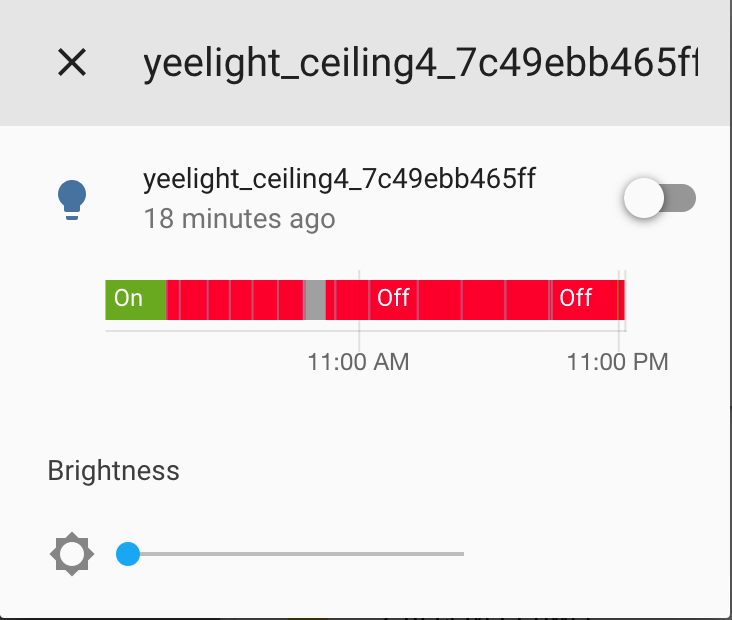 So yes, after addition of yeelight: into configuration.yaml its autodiscovered my lights and now its shows two lights for device - main and ambient! great! as expected. Thanks again for overall great contribution - hope you would share my vision on UX here ) Cheers! Please open an issue if you suspect a bug. If you want to suggest an enhancement please open a feature request in the Feature Requests section of our community forum. Merged PRs should not be used for enhancement discussion or bug reports. If you've found a bug it's ok to make a review with inline comments and link to an issue that reports the bug.